Chennai is well connected internationally and to other parts of India. Five major national highways radiate outward towards Kolkata (Calcutta), Bangalore, Trichy, Tiruvallur, and Pondicherry. 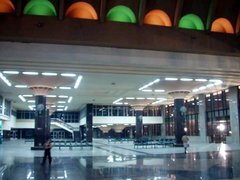 The Central Mofussil Bus Terminus (CMBT), which serves as the terminus for all intercity buses from Chennai, is the largest bus station in South Asia. Seven government owned transport corporations operate busses across the state and to nearby states. There are also many private bus operators in Chennai. The Chennai International Airport serves as the city's airport for both domestic and international flights. The city is connected to major hubs in South East Asia, the Middle East, Europe and North America through over fifteen international carriers. The airport is also the second busiest cargo terminus in the country. The city is served by two major ports namely the Chennai Port which is one of the largest artificial ports and the Ennore Port. The Chennai port is India's second busiest container hub handling general industrial cargo, automobiles etc. The Ennore port handles cargo such as coal, ore and other natural resources. A smaller harbour at Royapuram is used by local fishing boats and trawlers. 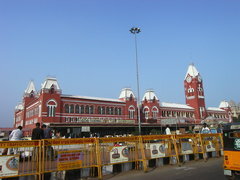 There are two main railway terminals, the Central Station which is the city's largest railway station with trains to all the major cities and towns in India, and Egmore Station, which serves destinations within Tamil Nadu. Buses and trains are the most popular public transport. The Metropolitan Transport Corporation (MTC) runs an extensive city bus system. The bus service consists of 2,773 buses on 375 routes, and transports an estimated 4.2 million passengers daily. Besides MTC services, Mini-bus services are present in the suburbs of the Chennai metropolitan area. Vans which are run like bus services and popularly called "Maxi Cabs" also ply on many routes in the city. Hired for of transport include metered taxis and auto rickshaws. The Chennai suburban railway network consists of three rail sectors, namely Chennai Central-Arakkonam, Chennai Central-Sullurpeta, and Chennai Beach-Chengalpattu. The rail network is broad gauge. Chennai also has an elevated MRTS suburban train system, which is interlinked with the suburban rail network.